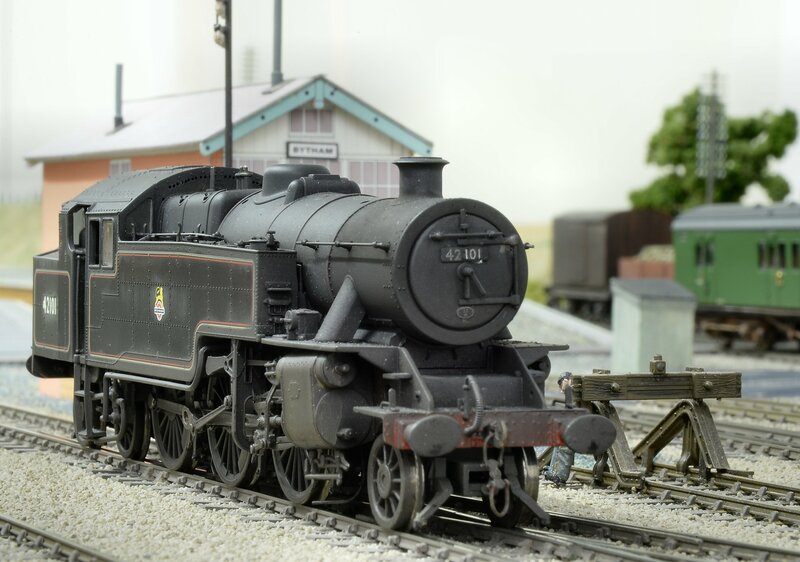 In 5 days time Herstmonceux will be on it way up to Manchester for The Christmas Model Railway Show . This will be the furthest I’ve taken the layout so far and I must say I’m really looking forward to it. Andy Coopers New Hey will be at its last show before moving on to a new owner. It’ll be good to see his layout again, the first time was at Manchester show some 6 years ago! At this show Herstmonceux will have a new operator as my friend Tom Foster is coming to help myself and some of the usual crew for the weekend. 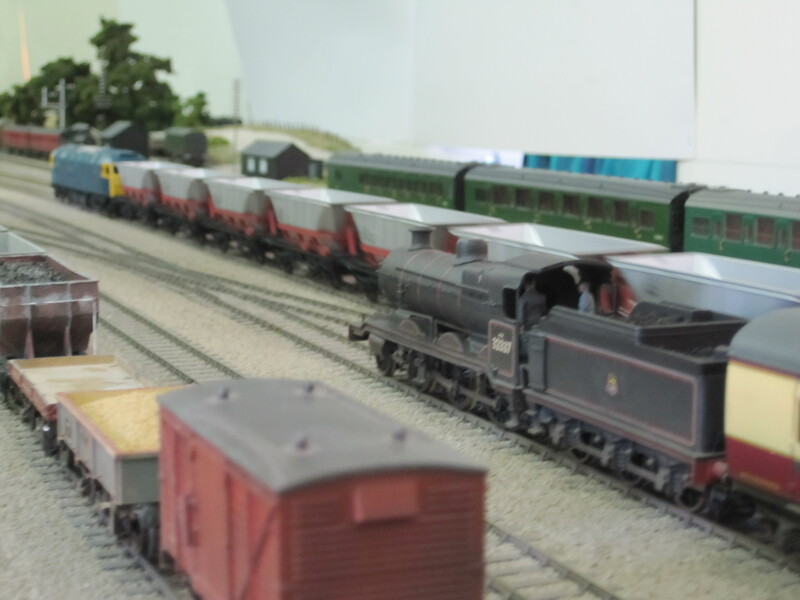 Hopefully he’ll get a good taster of whats to come when he finishes his Cwm Prysor layout. 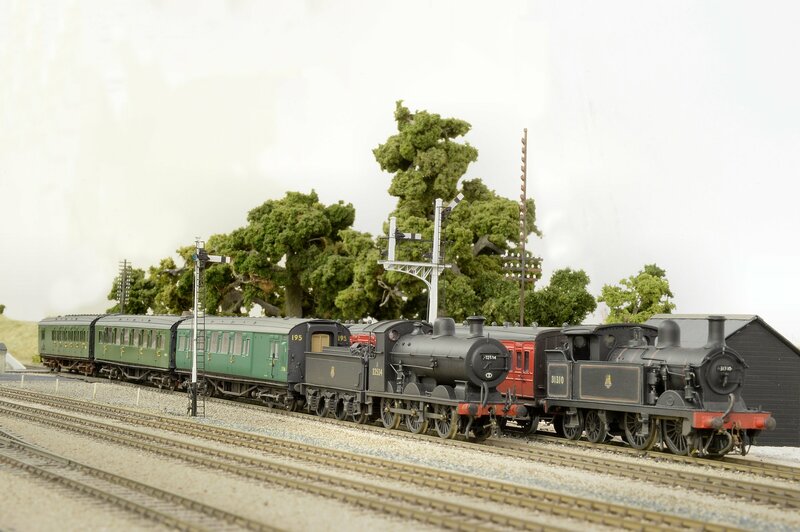 The loco roster has had some new locos added to it. I finally got round to respraying my Hornby Schools into BR black and renamed and numbered it 30930 Radley. I picked this one as I have pictures of it around the area and it has some rather usual lining compared to others. I have detailed a Hornby E2 with extra pipe work, lamp irons etc and also tried to convert a Hornby Terrier into something more like a A1x. This had the front footplate sandboxes cut off and new splashers added. The last loco I have been working on is a N1 and this has involved converting a Bachmann N. The cab and front end were replaced with extra parts out of a DJH kit. The cylinders took a bit of work and its not 100% but looks the part. Please excuse the poor picture. Hopefully you can make out the extras that have been added. I will try and get some better pictures put up after the weekend. I’ve also managed to finish off a few coach projects. 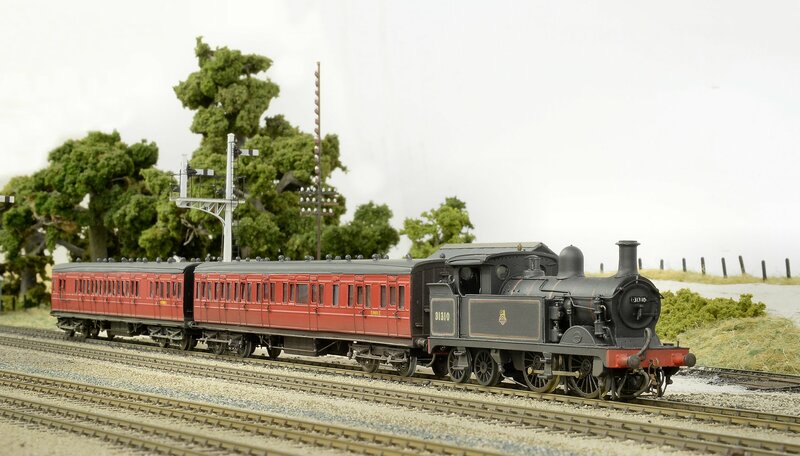 The restriction set now has 2 brake coaches. The set is made up from cutting the sides off Hornby Maunsells and filing the ends down slightly to narrow them ready for gluing on the Branchline conversion sides. I’ve also been working on a Maunsell Nondescript Brake Saloon. This is again a Hornby coach with sides cut off but with Bill Bedford sides attached and I will post some pictures when its finished. 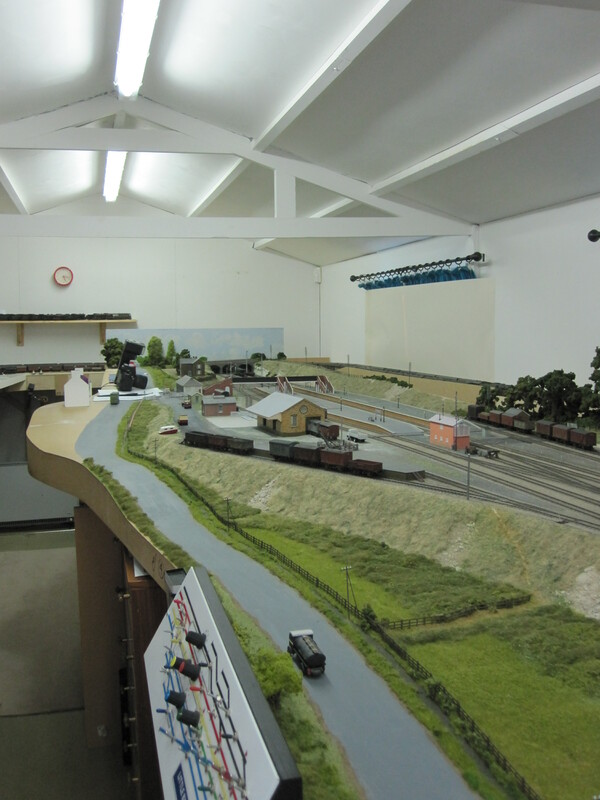 So bar a few more bits of packing to do and a good clean of the layout, Herstmonceux is ready for its trip. I’m sure it’ll be a cracking weekend and please do come say hello if you are at the show. 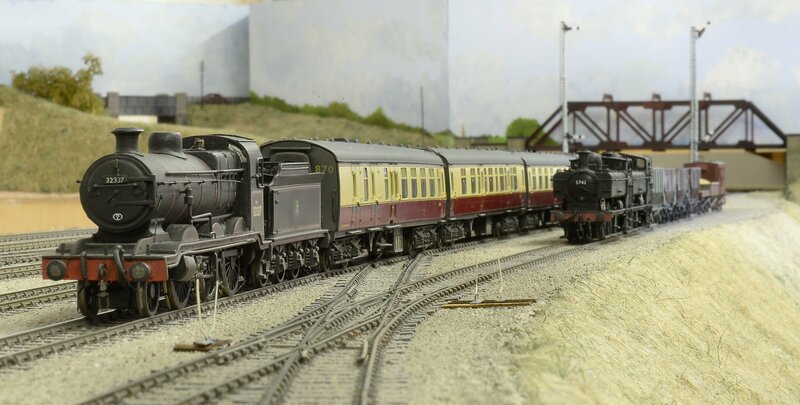 It was nice to give some of my locos a good run and it was great to received some lovely comments from Tony about my stock. Running Little Bytham with its Eastern Region stock and being able to discuss all aspects of it with Tony made it all the more interesting. Finding out one of the BR Mk1 GUV’s was a MTK kit and that some of the other beautiful stock was 40 odd years old was quite a shock. There were a few mishaps from the fiddle yard operator but Chris soon got the hang of it! and I got marked down for not noticing I had not set some signals. This all lead to good banter and contributed to great day with friends, old and new. I’d like to thank Tom for arranging the visit and of course thank Tony and Mo for their hospitality. I would also like to thank Tony for allowing me to use a few of the pictures he took on my Blog.